Hello! 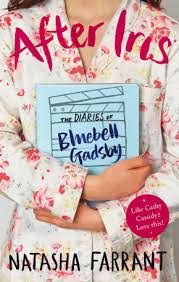 Today I am very pleased to be part of the blog tour for The Diaries of Bluebell Gadsby: After Iris by Natasha Farrant. I really enjoyed Natasha's previous book, The Things We Did For Love and so I jumped at the chance to be included in the blog tour for After Iris. You've dedicated After Iris to your brother and sisters, how would you say that your family compares to the Gadsby family? Well, I grew as one of three girls and a boy in West London, so from a logistical point of view we are quite similar… Beyond that, I think the resemblances between the Gadsbys and my family are those that you find in many big modern families – stressed parents, everyone clamouring for their slice of attention, constant arguments but lots of underlying love. The Gadsbys push all this to new limits, of course, but I do think they are representative of all families, more than my family in particular. I really love that the story is told in both diary entries and video transcripts. Why did you choose this unusual format in order to tell this story? 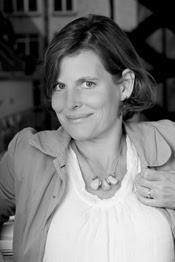 I spent a lot of time before starting to write thinking about who my narrator was, and how she would tell her story. Blue is completely isolated in her grief. She badly needs a confidante but she has no-one to talk to. All she can do is watch other people, and it’s only natural that she should turn to her diary to pour her heart out. The video-camera was inspired by a book I read a long time ago, In a Land of Plenty by Tim Pears, in which another lonely child recorded his family history by taking photographs. The camera is a brilliant metaphor for isolation – it allows you to look closely at the world, without being a part of it. I took it a step further, by having Blue make films rather than take photographs, making the process an integral part of the narrative. The diary/film format aren’t just a literary device: they’re an expression of who Blue is, and I think that’s why they work so well. I also had been thinking for a long time that I would love to write a screenplay, because I love the cinema, and this seemed like an interesting way to start! I really loved all the mentions of familiar London sights. Where would you say your favourite spot in London is? I have lots! I’m a genuine Londoner – half French but I was born here, and I wouldn’t want to live anywhere else. One of my all time favourite places are the formal gardens in Holland Park. They are round the back of the opera house, and on summer evenings we used to take picnics and listen to the singing. Once we hid and stayed long after the park had closed, which was magical. We broke into the adventure playground and ran around in the dark (this was as fully grown adults…) It has a dahlia garden which I have to visit every year at the end of summer, because dahlias remind me of my wonderful great-aunt Monique, so I go as a sort of tribute to her. There’s a giant chess board, a café, a tiny art gallery and the prettiest fountain which my children once dived into when they were little on a very hot day, leading the way for this joyous tidal wave of half-naked, splashing children, much to the consternation of the parks constabulary... London’s parks are amazing. They represent everything that is great about our wonderful city. The entire Gadsby family is dealing with sadness and grief in their different ways. Was there a particularly difficult scene that you found hard to get right or kept coming back to? Do you have a favourite fairy tale or bit of Arthurian legend? I don’t have a particular favourite, but when I was little, my French grandmother had a beautiful clothbound illustrated edition of Charles Perrault’s fairy tales, which I used to read whenever I went to stay with her. I think it’s one of those books that made me love all books. It was kept in a drawer in the tiny room where we slept. I used to take it out like it was a secret treasure, and I never shared it with anybody. Also, my mother used to travel to Russia a lot and bring us back books of Russian fairy tales, all princesses and wolves and snow and bears… I loved those. Finally, After Iris made me cry uncontrollably, is there a tear jerker book you've read recently that you'd recommend?